In the vineyards of Bordeaux the first sign of spring is not a field of snowdrops poking their heads through the frosty ground, or a glimpse of darting swallows high in the twilight sky. Each year the world’s most famous wine region shakes off the winter blues and switches into celebratory mode, for this is the season of the primeurs. The world’s top wine buyers, journalists and serious collectors descend on the sleepy byways of Bordeaux en masse, setting up camp for a week of intensive, tongue-staining tastings of the infant new vintage. These are raw young wines, thick with tannin and heavy with oak, having been in barrel for just a few months and still a year away from being bottled. And yet so eager are Bordeaux followers for news of the latest vintage that they seize on every tweet, blog and email emanating from the primeurs for the first clues to the vintage’s quality and potential. Part business Expo, part trading floor, part week-long party, primeurs week is unique amongst the world’s great wine regions. Its purpose is not simply for the Bordelaise to show-off their wines, but to facilitate an elaborate and ancient courtship ritual. 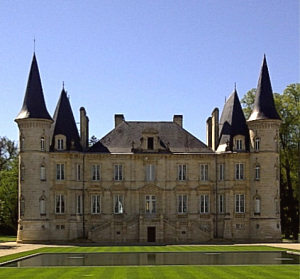 The Bordeaux châteaux maintain their distance from the grubby businesses of actually selling their wine. Instead, middle-men known as courtiers buy from the châteaux and sell to other middle-men known as négociants. Both are out in force at the primeurs, but so are the world’s wine merchants and importers, trying to gauge just how good quality is and decide which wines they will try to secure. Right: Château Pichon Baron. This is an extremely rarefied, but big business. Unprecedented demand for the limited production of the top Bordeaux estates has driven prices to stratospheric levels: Far Eastern and wealthy Russian collectors have added fuel to the Bordeaux fire, and the wines of the dozen top châteaux will now set buyers back a cool £1,000 per bottle or more – some of them much more. The tiny ‘garagiste’ wines of the Right Bank, like Pomerol’s Château Le Pin, can be yours for a mere £20,000 per case of 12 – that’s around £450 for a standard pub measure. But perhaps the most curious and mind-blowing price is being achieved by the ‘second wine’ of the Left Bank’s illustrious Château Lafite-Rothschild. All five of the ‘first growths’ – the absolute top rank estates – produce a second wine each year which is, basically, the stuff that’s deemed not good enough for the Grand Vin. Lafite’s version is called Carruades de Lafite and it sold for around £200 per dozen just five or six years ago. But enormous demand from wealthy Chinese wine lovers has driven its price close to £5,000 per case. Why? Well theories abound that this is simply a case of mistaken identity by less knowledgeable Chinese consumers. Indeed investment now fuels the top level of the Bordeaux trade just as much as collecting and connoisseurship. Much of 2010’s top wines will be traded or auctioned many times before they are ever drunk, and will form part of a portfolio of investment products for wealthy individuals, corporations and investment funds. But in primeurs week the focus is on the stuff in the bottles. The crunch of Gucci loafers on pristine white gravel and waft of freshly cut grass are the signature sounds and smells of the week as the châteaux – buffed, preened and polished to perfection – throw open their doors. It is a glorious occasion, and many play along, turning the normally sleepy D2 road past the famous châteaux into a mini-Cannonball run: I let a screaming red Ferrari Testarossa pass me on a straight stretch, whilst the jolly pair nursing their huge, British-registered Bentley round the narrowest bends seemed to be having a whale of a time. Tasting-wise, the main activity centres around the Union des Grands Crus, who set up shop in various properties around the Bordeaux communes, where all of their members from that commune – Pauillac, Margaux or St Emilion for example – gather to pour samples of their latest vintage. The tasting rooms buzz with the clink of glasses and chatter of people comparing notes. At lunch time, blindingly white marquees set on those manicured lawns served discs of foie gras on toast along with back vintages of the wines for those with the stamina to face them. But it is away from these tastings that the altogether more glamorous side of primeurs week is found. The grandest names of Bordeaux – the ‘first growths’ of the left bank and the superstars of the right bank – do not deign to show their wines amidst the clamour of the UGC tastings. Instead, appointments are made for individual visits where the hushed atmosphere underlines the gravitas of the occasion. And each visit is an experience: at Cheval Blanc it seems a team of crack Broadway set designers create each year’s look, with colour co-ordinated furniture, enormous flower displays and little tasting stations set out with military precision. 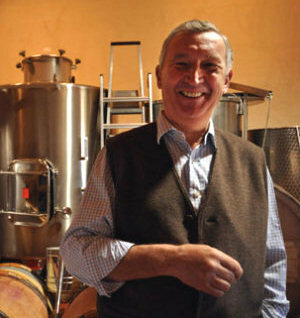 At Le Pin it’s a diametrically opposite affair with owner Jacques Thienpont, in sports jacket and flannels, enthusiastically pouring samples (worth around £100 a shot) for the half dozen lucky tasters crammed into his tiny cellar (left, courtesy Farr Vintners). There is an air of celebration during the primeurs, but Bordeaux is packed and there’s not a hotel room to be had. However the region is worth exploring at any time, with plenty of attractions to keep the non wine-buffs happy too. The city (below) has many delights, but you can even grab some rays (and a plate of mussels with a chilled bottle of Bordeaux blanc) just an hour to the west on the beach at Arcachon, complete with the tallest sand dune in Europe. Driving around the vineyards is fairly relaxing too, especially on the ‘left bank’ which is relatively short on tourist facilities and which appeals most to those with a serious wine interest. The most famous châteaux are open strictly by appointment. Mouton-Rothschild in Pauillac conducts daily tours and tastings and there’s a wine museum and shop selling memorabilia, whilst Prieuré-Lichine in Margaux is one of the most visitor-friendly of all left bank estates. Both will accept walk-up visitors if space permits, though appointments are advised. Some facilities are developing, and especially noteworthy is the Village de Bages, a hamlet close to the famous Lynch-Bages vineyards in Pauillac, where former owner Jean-Michel Cazes has created a gastronomic centre amongst the immaculately restored buildings including an excellent café-restaurant, bakery and gourmet boutique. You will find it just off the D206. But the wine buff will derive enormous pleasure from just driving past road-signs reading ‘St-Julien’ or ‘Pauillac’, at recognising the famous outlines of beautiful châteaux like Palmer in Margaux or Pichon-Baron in Pauillac, and in glimpsing the tower at Latour or gates of Léoville-Las-Cases, each so familiar from the label of their famous bottle. Over on the right bank – the communes of Pomerol, St Emilion and their satellites – you will find the smaller-scaled, more intimate face of Bordeaux. Hundreds of small châteaux welcome tourists with their ‘Vente Directe’ signs and tasting rooms. The medieval town of St Emilion (a UNESCO World Heritage site) with its cobbled streets or the impressive fortified town of Libourne on the banks of the River Dordogne make excellent bases to eat, sleep or explore. This up-market hotel, restaurant and spa offering vinotherapy treatments is part of the Smith-Haut-Lafitte estate. It boasts a Michelin-starred restaurant. Doubles from £250 per night. The best address in the city centre, offering the full five-star Bourgeois comfort and glamour, close to the Opera and other historic attractions. Doubles from £320 per night. Fine budget choice, an elegant 18th century three-star with well-equipped rooms including wifi and air-conditioning. Very centrally located, and doubles from £100 per night. Bordeaux’s most famous foodie temple with the emphasis on preserving ingredients and cooking techniques of the Southwest. Hearty but upmarket food and summer dining on the terrace. It may seem a little perverse to recommend a Chinese restaurant in Bordeaux, but the quality of food is exceptional and the wine list heroic. Informal, and normally packed. Across the River Garonne (an easy stroll) and built on stilts over the water with amazing views of the city, the food doesn’t need to be good, but is. Respectful, but fusiony cuisine. You can also stay here in amongst the vineyards (from £220 per night) or enjoy some of Bordeaux’s most refined cooking from Thierry Marx. Full-on, Michelin-starred bells and whistles. From a somewhat grimy decline in the 1980s, the city of Bordeaux has reinvented itself. It is now an attractive and charming city thanks to go-ahead mayor Alain Juppé. Strolling amongst the historic buildings of the centre is easy, with a multitude of churches and museums to visit, and riding the futuristic tram is fun. The Maison du Vin opposite the tourist office offers guides to the region’s wines, tours and tastings. The tram system in Bordeaux is big, fast and efficient. Buy a booklet of 10 tickets from machines on the platform to save money. This article first appearedin Square Meal magazine.